Red and white discount sign cards printed one side on heavy card stock paper. This sign card is an effective and inexpensive way to display a sale to your customers. 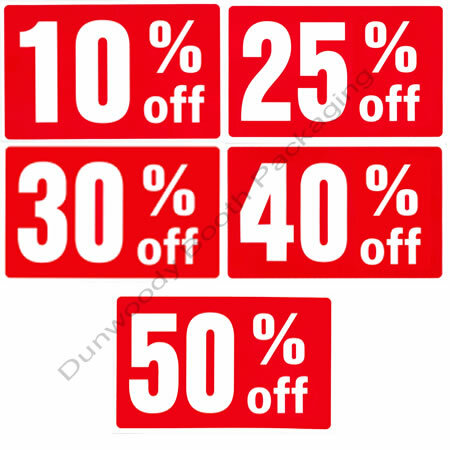 Get these sign cards in any common sale percentage required. 9A526225 - 7" x 11" Discount Cards - "10% Off"
9A526200 - 7" x 11" Discount Cards - "25% Off"
9A526205 - 7" x 11" Discount Cards - "30% Off"
9A526210 - 7" x 11" Discount Cards - "40% Off"
9A526215 - 7" x 11" Discount Cards - "50% Off"